intermolecular : cohesive bonds between molecules (Van der Waals bond, hydrogen bond). The power of water’s solvent properties (dipolar molecule) causes the partial or full breakdown of various bonds between atoms (dissociation) and within molecules (ionisation) in the substance to be dissolved, and replaces them with new bonds with its own molecules (hydration), as well as creating new dispersed structures. Full solvation constitutes dissolution. The solubility of gases obeys Henry’s laws (see theoretical bases for gas/liquid exchanges and characteristic constants of gases). 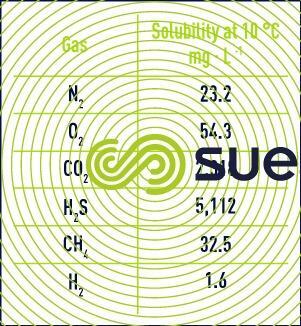 By way of an example, subject to a gas pressure of 101.325 kPa (1 bar) at 10 °C, the solubility of the main gases is represented in table 5. The polarity of molecules makes them more soluble in water, in particular for CO2, H2S but also NH3. In addition, these polar molecules easily dissociate in water and react with H+ and OH- ions and transform into ions such as HCO3- and CO3- (for CO2) or HS- and S- (for H2S). We can therefore transfer a vast quantity of CO2 into water with a high pH (do not confuse chemical and physical balances). As oxygen is more soluble than nitrogen, the dissolved gases extracted from water are richer in oxygen than the atmosphere with which the water was in a balanced state. The solubility of CO2 in water in balance with the atmosphere is approximately 0.7mg/l, deducted from the solubility in a pure gaseous atmosphere of 1 bar (See table) multiplied by the partial pressure of CO2 in the atmosphere of approximately 0.03% (0.03% is also the concentration in volume per volume). Nb : this value is increasing and cause global warming. As the water molecule is polar, a liquid’s solubility in water depends on the polarity of the molecules in the liquid in question. For example, molecules that include OH (alcohols, sugars), SH or NH2 functional groups, being very polar, are highly soluble in water, whereas other liquids (hydrocarbons, carbon tetrachloride, oils and fats etc.) that are non polar, are sparingly soluble. Partial miscibility can occur: for example, when a substance is only miscible in all proportions with water above a critical temperature (a temperature higher than 63.5 °C for a water-phenol mix), or below a lower limit (trimethylamine is only fully soluble in all proportions at a temperature below 18.5°C) or between two critical temperatures (for example: the water-nicotine system). The dissolution of ionic or polar compounds occurs through an association of water molecules with cations via the oxygen atom and with anions via the hydrogen atom. Solubility increases when the ion’s polarising power, which is defined by the ratio of its charge over the square of the radius, increases (in the case of magnesium and calcium sulphates, caustic soda and sodium chloride). The ions’ solvation results in water molecules being organised over several layers. The solutions’ structure is all the more different from that of pure water in that the ions are small, and have a high charge density (as is the case with Li+, Na+, Mg2+, Ca2+, F-, and HO-). These ions are called type I structural ions: in solution they are more viscous than water at the same temperature. The solvation of medium-sized and charged ions (K+, Cs+, NH4+, NO3-, CℓO4–) produces a loss of the original structure which is not compensated for by the reorganisation that occurs. These structure-removing ions lead to a drop in the viscosity. Ions that are only slightly polarising, such as NR4+ quaternary ammonium ions (R = the alkyl group) develop a weaker interaction with water: they are incorporated into the liquid without greatly modifying the water’s network of hydrogen bonds. They are called type II structural ions. Solid organic compounds that are polar or susceptible to ionisation are soluble in water (as is the case with citric acid). To the contrary, standard long-chain polymers (polyethylene, PVC, cellulose, polyurea, etc.) are insoluble in water. Inserting polar functional groups allows dissolution to a certain extent (for example, detergents, and polyelectrolytes such as polyacrylamides). Solubility in water depends on the nature of the substance, or at least on certain of its constituent groupings. Consequently, the characteristic groupings are classified as hydrophilic, in other words capable of establishing attraction interactions with water (OH, CO, NH2, etc.) or hydrophobic, in other words which are subject to repulsion in relation with water (CH3-CH2, C6H5). Hydrophily therefore characterises the affinity of compounds with water. In certain cases, solvation requires a third component as an intermediary, which is referred to as a solubiliser for true solutions, a peptiser for colloid solutions, a stabiliser for emulsions, and an emulsifier for suspensions. These surfactant intermediaries create real bonds between the solvent and the substance to be either dissolved or kept dispersed. their dispersion by a break in the intermolecular hydrophobic interactions (the action of detergents such as alkyl benzene sulphonates, trisodium phosphate, membrane lipids, and the action of emulsifiers to stabilise the “soluble” oils). Other compounds used as intermediaries can, to the contrary, break the bond between the solvent and the dissolved or dispersed substance. Depending on the case in question, this agent is called the precipitant, coagulant, flocculant, or thickener. This break can be the result of a chemical action: a loss of OH- ions or the neutralisation of ionised groups. The intermediary can destroy the polar interaction constituting the attraction bond with the water by capturing the hydrophilic part or by absorbing the hydrophobic part on the surface of air bubbles (flotation) or of an insoluble material that is hydrophilic to a greater or lesser extent. The break can be the result of a neutralisation of the electrostatic forces (the action of polyvalent cations and polyelectrolytes). molality [B]: the number of moles of solute B dissolved in one kg of solvent A. A solute’s molecules behave in the solvent the same way as a gas would in another gas. When the solute is greatly diluted, the solution can be likened to an ideal solution that obeys Raoult’s law when it comes to water, and Henry’s law when it comes to the solute. HB: Henry’s constant in relation to the solute in solvent A. When the concentration becomes noble, interactions between the solute molecules occur and deviations appear (real solutions). In order to take this into account, you replace the solute concentration with relative activity aB. The activity, the thermodynamic quantity, is linked to the concentration by a factor called the activity coefficient, the symbol for which is g or f, depending on the concentration unit. This coefficient trends towards 1 when the solution is highly diluted.